Vaunted performance-boat builder enters upscale yacht market—exclusive first look from boats.com. 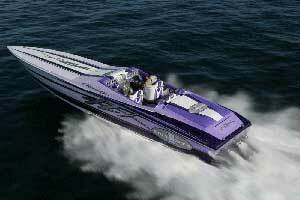 With twin 1,000-hp diesel engines, the 55' Cigarette Super Yacht can cruise at more than 50 mph. Last week's unveiling of the 55' Cigarette Super Yacht opened a new chapter in the storied performance-boat builder's history. With resin-infused 55-footer, the builder hopes to reach beyond its go-fast boat legacy—so rich and extensive that the general public often refers to any high-performance boat as a "Cigarette boat"—and expand into the mid-size performance-yacht market. 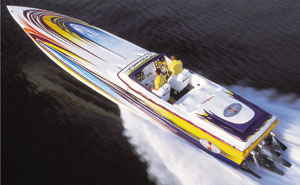 "We've been working on this for three years, and we're proud of it," said Skip Braver, owner and chief operating officer of Cigarette Racing Team, during the boat's media debut on the at Big Fish restaurant on the shores of the Miami River. "We think current Cigarette owners, as well as buyers who've never owned a Cigarette, will love it." The layout for the 55' Cigarette Super Yacht features three cabins—a master stateroom with a private bathroom, a guest stateroom with a separate entrance to the guest bathroom (which also is accessible through the saloon) and a smaller single-berth cabin. 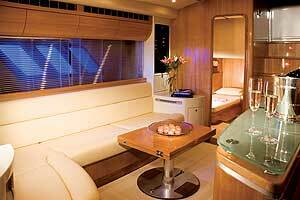 Both staterooms have queen-size beds, flat-screen televisions and generous locker space. Galley amenities include a full-size refrigerator freezer and a Wolf convection stove. The saloon has 6 feet 7 inches of headroom. Cockpit highlights include a power sunroof and an outdoor entertainment center with an electric grill, an icemaker and a refrigerator. On stern of the yacht, there's a hydraulic swim platform that raises and lowers for access to the transom "garage," which can accommodate a 10-foot-long tender. Without question, the mid-size performance-yacht market is competitive. 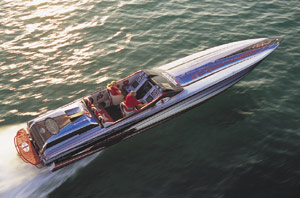 The 55' Cigarette Super Yacht will go head to head with offerings from better-established companies such as Sunseeker. Other performance-boat builders have attempted to enter the mid-size performance-yacht market, and most of those efforts have failed. 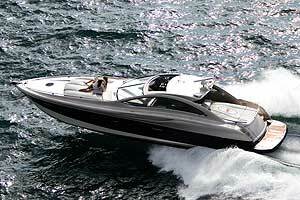 But according to Braver, there is already significant demand for a Cigarette yacht from current Cigarette customers. (The model at the media presentation sold the day before the event, and the next three models in production reportedly also are sold.) Building the 55-footers in Turkey, he says, is another crucial key to their long-term success. "We know what we're good at, we know what we can do," said Braver. "We have the space at the Cigarette plant to build the Super Yacht if we expand, but the systems that go into it and all the other processes are just too complicated for us here. The people we're working with in Turkey know how to build yachts, and we're there all the time. We don't ever see bringing production here." 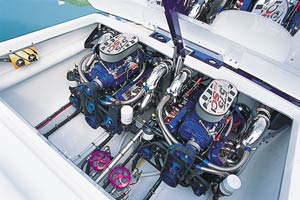 For power, the yacht is offered with either twin 800-hp or 1,000-hp MAN diesel engines. 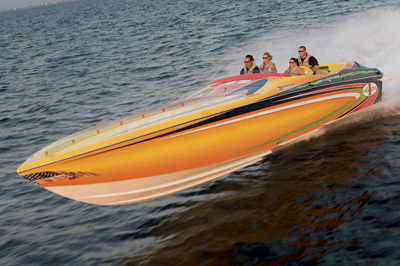 With the dual 1,000-hp engines, the boat reportedly tops out at 61 mph and cruises at 52 mph. Range at cruising speed with the larger power is approximately 400 nautical miles. Price for the 55' Cigarette Super Yacht starts at $1.5 million. 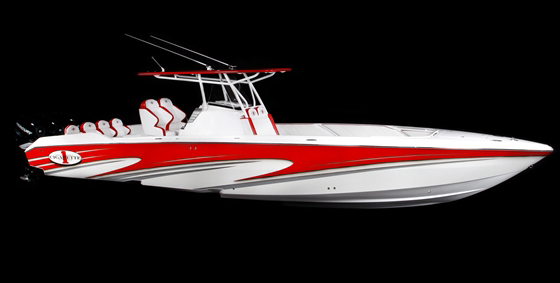 For a closer look at the new model, see the September 2007 issue of Powerboat magazine. 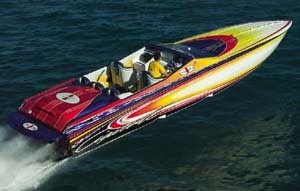 Editor's Note: Matt Trulio is the powerboat editor for boats.com.